Hardwood floors are often found in older buildings and present a difficult surface for additional flooring surfaces during renovation. 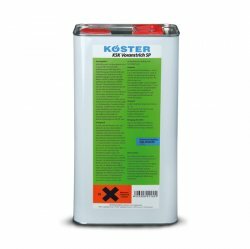 KÖSTER SL Flex is a mineral based underlayment for application to a wide variety of substrates including concrete floors, screeds, asphalt, steel, tile or wooden floors. The material is flexible enough to accommodate the movements of the wooden surface as well as high localized pressure resulting from furniture or dropped items. Before installation the substrate has to be free of dust and bonding inhibiting particles such as oil and grease. When applying over tongue and groove wooden floors, cleaning agent and care product residues such as wax must be completely removed, if necessary sanded off. Painted areas must be sanded and subsequently vacuumed. Floor boards must be firmly attached to the joists with screws. Open or wide joints between the boards, defects, and hollows have to be filled with an acrylic jointing compound. The prepared wooden surfaces is then primed with KÖSTER VAP I® 06 Primer. KÖSTER SL Flex stabilizes the surface due to its high flexural strength. As a result, the floor experiences less buckling under stress and allows the installation of tile, which under high surface movement would have inevitably come to damage.